The Sony A9F is an outstanding OLED TV, one of the best we have ever tested. Like all OLEDs, it delivers perfectly deep blacks, and has wide viewing angles. 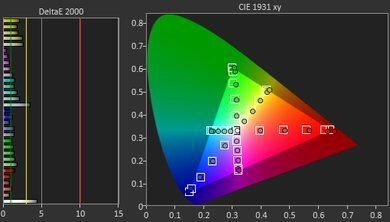 HDR looks great thanks to the excellent wide color gamut, and the best color volume that we've measured so far on an OLED. It has excellent motion handling, low input lag, and all four HDMI ports support HDMI 2.0 full bandwidth. Unfortunately, it isn't very bright with bright white scenes. 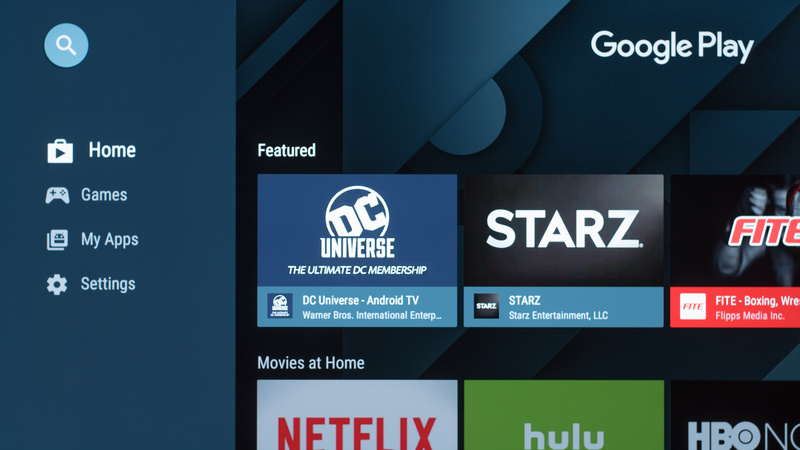 The Android 8.0 smart platform is much faster than previous Sony TVs. Brightness is limited in white scenes. Update 10/3/2018: Retested the brightness after firmware PKG6.0348.0059NAA. All measurements are essentially unchanged, and the TV still aggressively dims when the screen isn't moving. You can read more here. The A9F has an outstanding design. 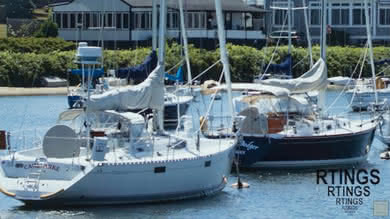 It looks great, and is built with premium materials and an impressive attention to detail. The TV has excellent cable management, providing for an extremely clean look. 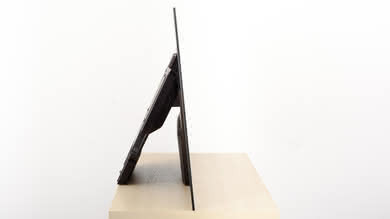 Like the A1E, there are small rubber feet under the screen, so the screen itself is not resting on the table beneath it, and the screen tilts back slightly. Unfortunately, the design makes the A9F difficult to move, but most people are not going to be moving the TV often, so this shouldn't be an issue. The stand design of the A9F is very similar to the Sony A1E. 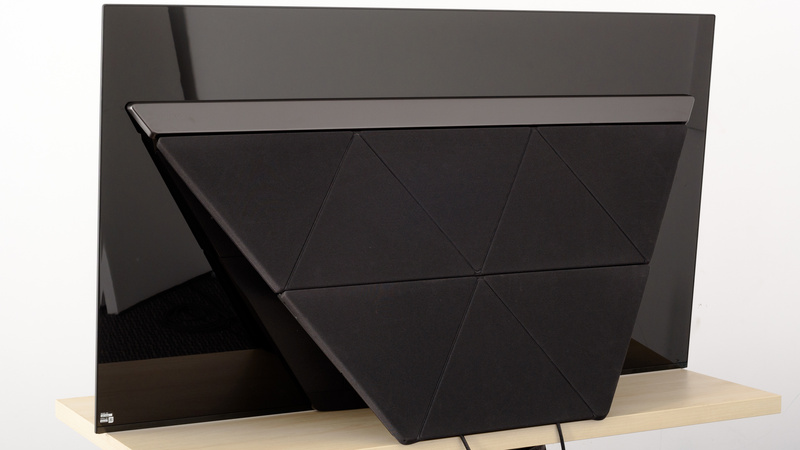 The stand is large and quite bulky, but supports the TV extremely well. Like the A1E, the stand causes the TV to lean back at a slight angle. 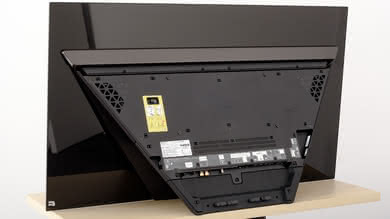 The stand cannot be removed, as it contains the majority of the TV's electronic components. There are two sets of feet underneath the screen portion of the A9F. The inner set of feet are larger, and appear to play a larger role in supported the TV. These feet require a surface at least 12.8" (32.5 cm) wide. Footprint of the 55" stand: 11.5" x 48.3"
The back of the A9F looks extremely clean with the covers on, and has excellent cable management. The back panels have a fabric cover on them, similar to speaker panels. The borders of the A9F are very thin. 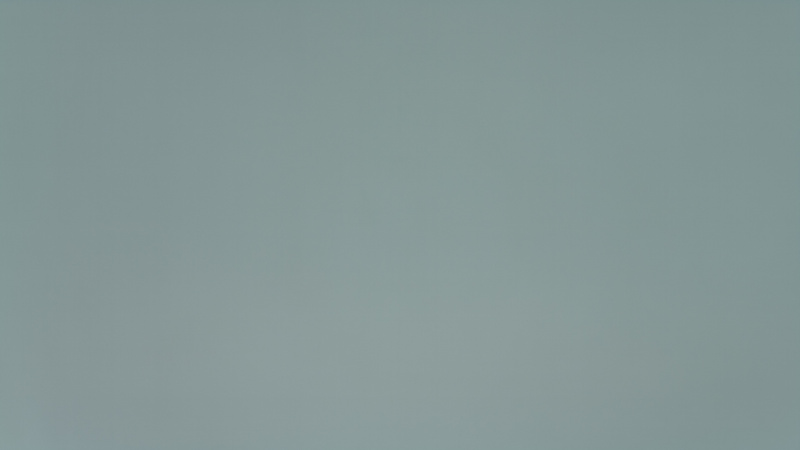 There is no noticeable gap between the border and the first row of pixels. The display itself is quite thin, but the stand behind it is large. 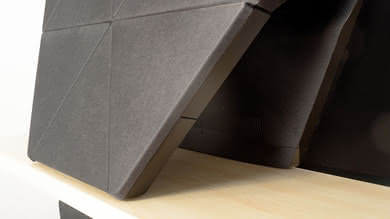 The stand can be folded in when wall mounted. The display portion of the screen is almost twice as thick as the LG OLED TVs, but still very thin. The thickness measurement was taken with the stand folded in, as if the TV was wall mounted. 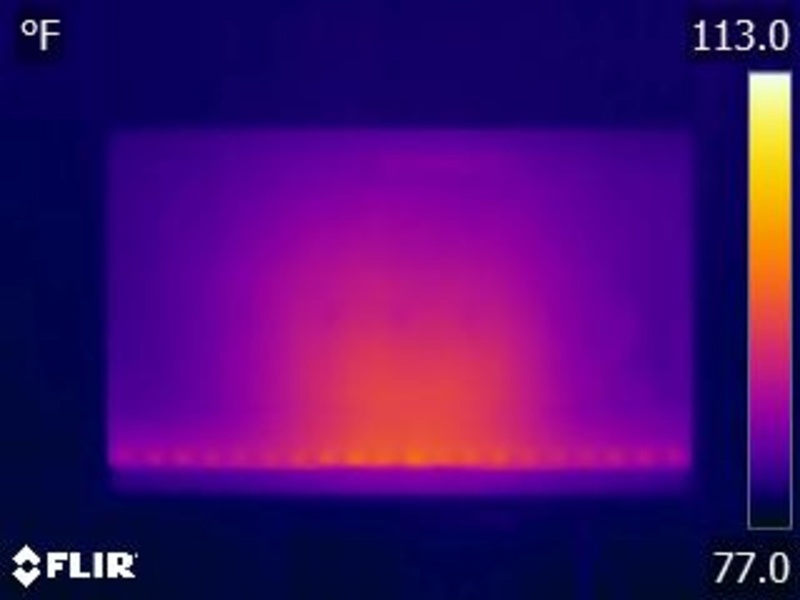 The A9F runs fairly cool, with the warmest part being near the bottom where some of its electronics are. There should be no issues with temperature. Outstanding build quality. The A9F is well built using premium materials. There are no gaps or cracks in the framing that could cause issues down the road. The XBR-55A9F delivers excellent picture quality. The OLED panel is especially well suited for a dark room, as the self-emissive technology delivers perfect blacks. The A9F is bright enough for most rooms, but it doesn't get very bright with bright white scenes. It has an excellent wide color gamut, and the best color volume we've measured on an OLED. 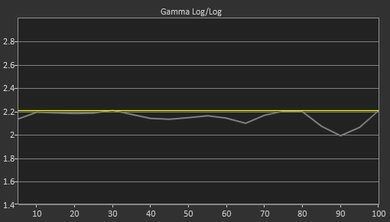 Out of the box picture accuracy is good, and most of the measured inaccuracy is due to the fact that Sony is now targeting 2.4 gamma instead of 2.2. Large areas of similar color look great, as the A9F has the best gradient performance we've ever seen, even better than the Z9F. 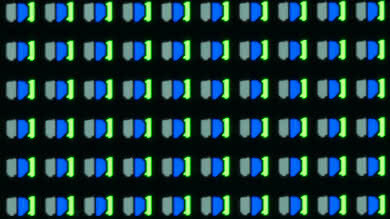 The self-emitting technology of the OLED panel allows the TV to turn individual pixels on or off as needed.  This delivers perfect blacks and an infinite contrast ratio. 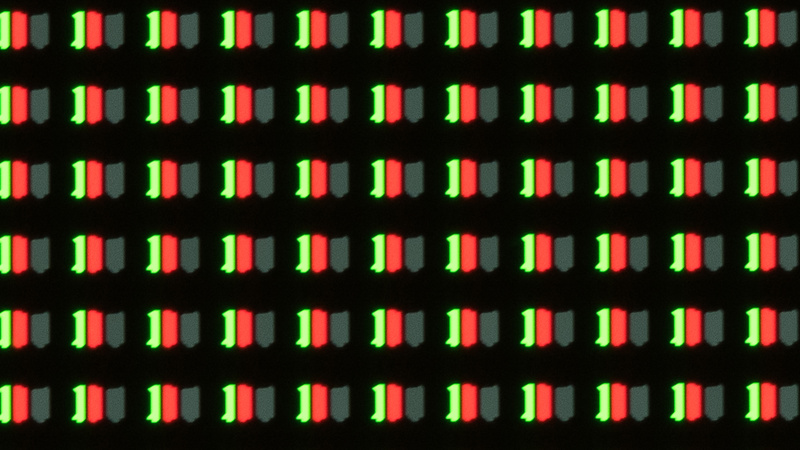 Like all OLED TVs, since each pixel is self-emitting there is no local dimming as each pixel can dim individually. Good peak brightness in SDR on the A9F. Overall, it is similar to the A8F. Large white scenes aren't very bright due to the TV's ABL. When Peak Luminance is set to 'Off', the A9F displays at a constant luminance of ~140 cd/m², regardless of content. In any mode, the TV automatically dims after about 2 minutes of displaying static content, and this can't be disabled. Update 10/03/2018: Retested the brightness after firmware PKG6.0348.0059NAA. All measurements are essentially the same as before (+/- 15 cd/m²). 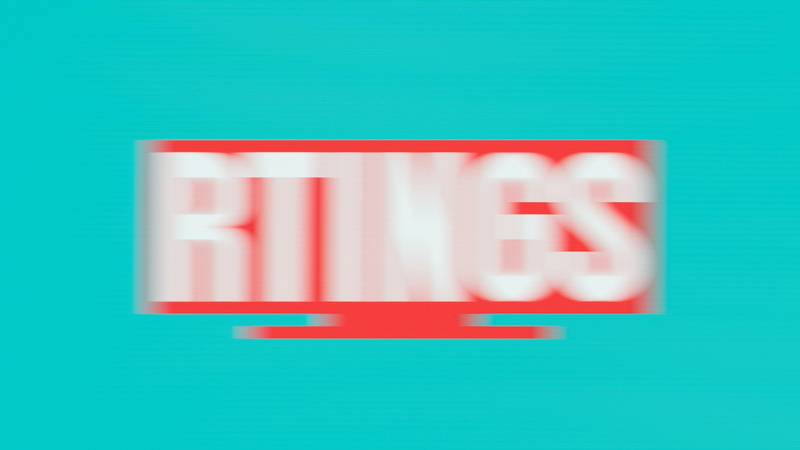 Notably the TV's aggressive dimming over time is unchanged; sometimes the TV dims after just two minutes of static content, as shown in the plot over time. The measurements in the review have not been changed. 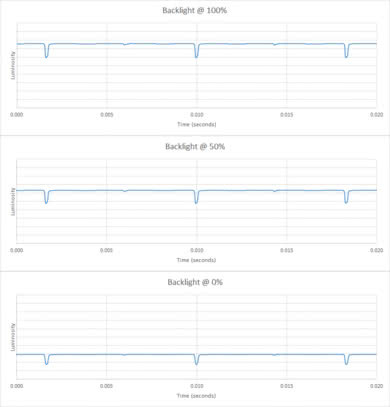 Update 02/27/2018: Retested the brightness using a PC as the source, so we can automate testing; previously we were using a Samsung K8500 Blu-ray player as the source, but we found that it was sending a brighter signal than a PC (perhaps by sending 'brighter than white' stimuli). 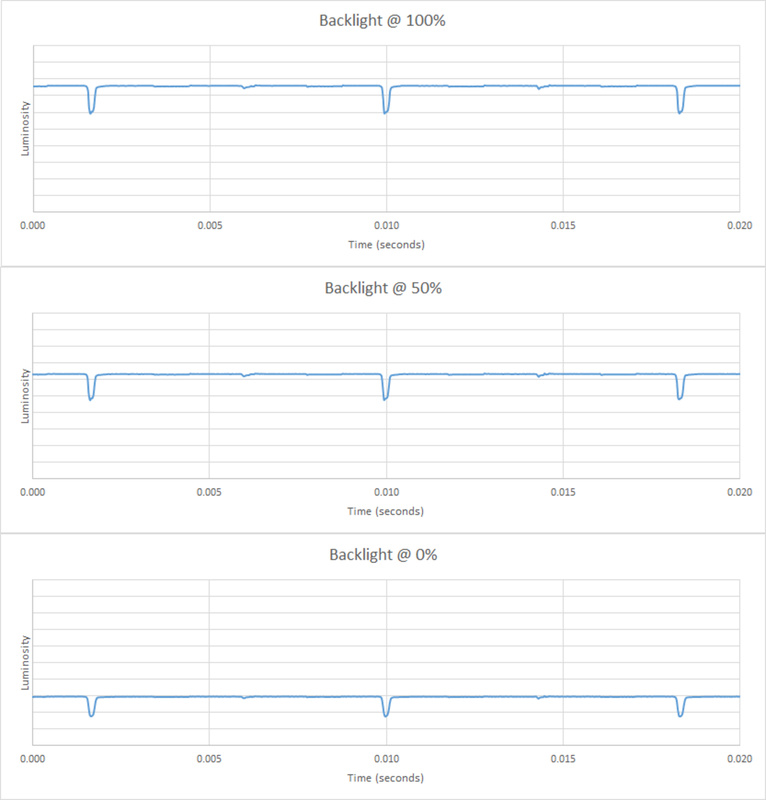 The A9F was retested with the PC as the source, and treated this signal differently, causing its measured brightness to be ~50 cd/m² less; however, we consider this to be more accurate to most sources. The test scores have been updated. Decent peak brightness in HDR. Small highlights in some scenes get bright enough to stand out, but bright white scenes are dim. 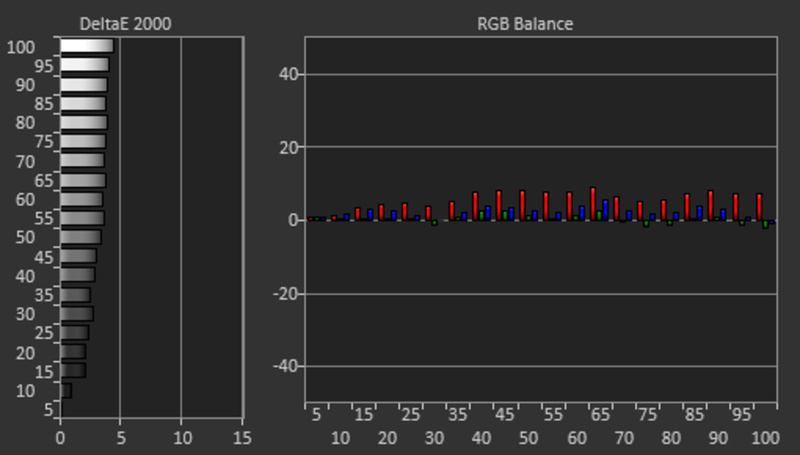 Overall, the A9F's HDR brightness is slightly worse than the A8F, as some small details in some scenes aren't as bright. 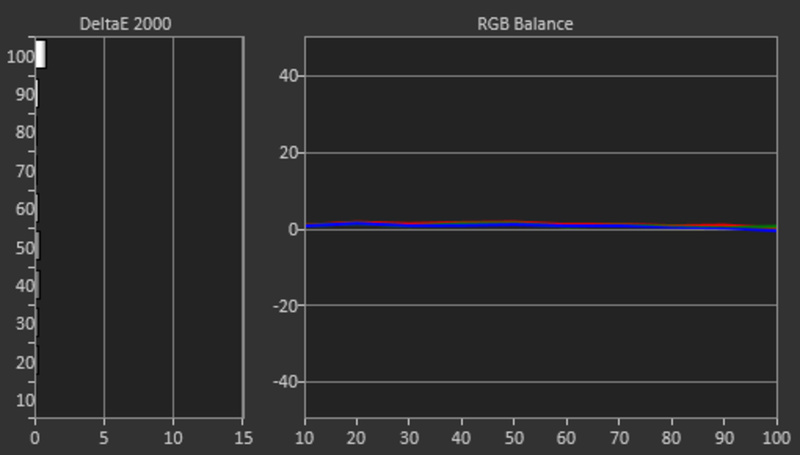 If you find HDR content too dim, you can adjust the Contrast and Gamma to your liking. If it is still too dim, increase the Adv. Contrast Enhancer setting to your liking. Update 10/03/2018: Retested the brightness after firmware PKG6.0348.0059NAA. All measurements are essentially the same as before (+/- 15 cd/m²). 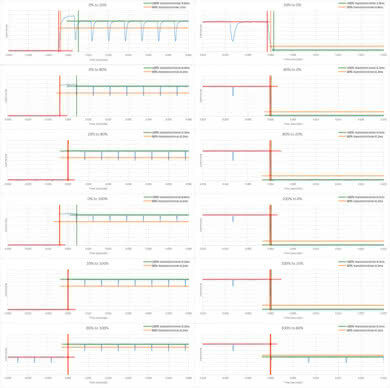 Notably the TV's aggressive dimming over time is unchanged; sometimes the TV dims after only one minute of static content, as shown in the plot over time. The measurements in the review have not been changed. The Sony A9F has excellent gray uniformity, similar to the LG C8 and Sony A8F. There is very little dirty screen effect, and there shouldn't be any issues watching sports.  In dark scenes, as measured with the 5% gray, there are some noticeable vertical bands. This is commonly seen on OLED TVs but shouldn't cause any issues. The A9F has nearly identical viewing angles to the other 2018 OLED TVs, like the A8F and C8. Like all OLED TVs, the image remains very accurate even at wide viewing angles. The Sony A9F has perfect black uniformity thanks to the OLED panel which can turn off black pixels completely. The A9F has a glossy finish, nearly identical to the A1E. Like most high-end TVs, this TV is great in a bright room, and most reflections are significantly dimmed and have a slight purple tint. Good color and white balance out of the box. Like most Sony TVs, the most accurate Picture Mode out of the box is 'Custom'. The color temperature is a bit on the warm side, but this likely isn't noticeable by most people. 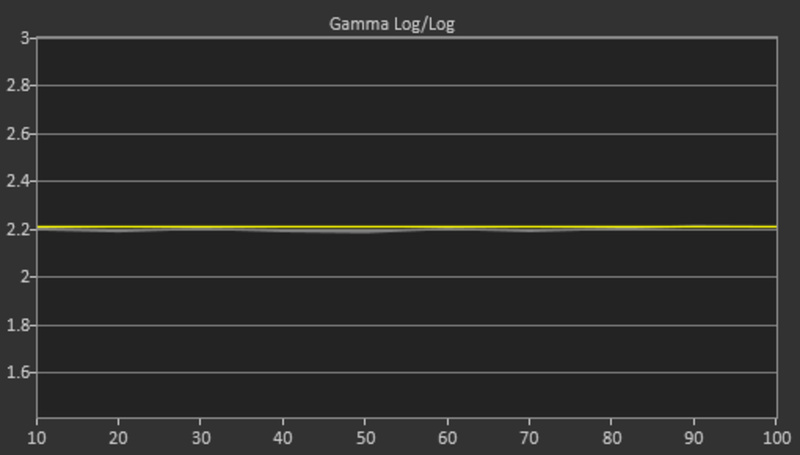 Sony 'MASTER' TVs, including the A9F and Z9F, appear to target a different gamma to the 2.2 standard. This is strange, because previous models followed our target of 2.2 accurately in the 'Custom' picture mode. 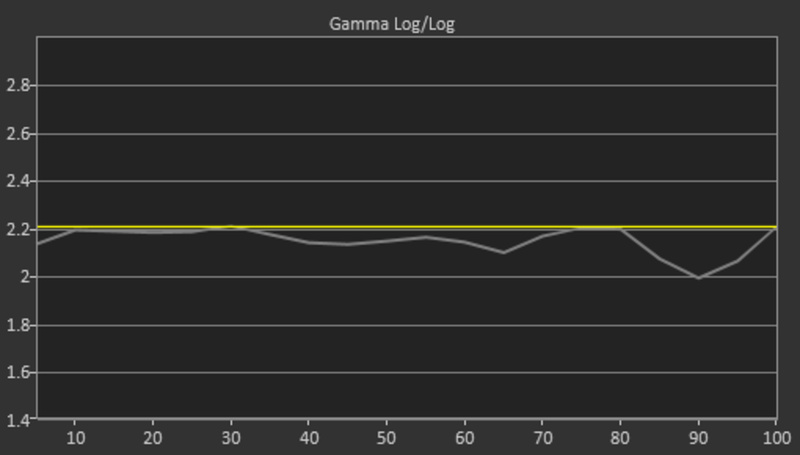 Update 02/27/2019: Retested with the 'Gamma' setting set to '0', rather than '2' as it is by default, so the TV better tracks the 2.2 target gamma; the score has increased as a result. All test scores and pictures have been updated. The new Sony CMS is easier to use than LG's, and results in excellent color and white accuracy. Any remaining inaccuracies are not noticeable without specialty equipment. 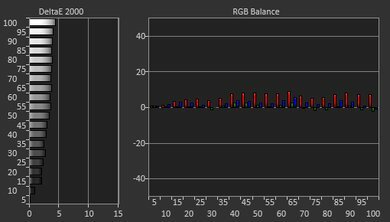 The gamma is flat at our target of 2.2, and the color temperature is close to our target of 6500 K.
480p content looks good, with no obvious artifacts. 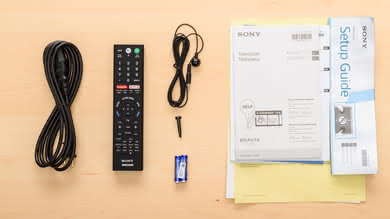 1080p content is displayed well, but when sent a 1080p signal with a 60 Hz or lower refresh rate, the A9F switches to nearest neighbor upscaling, like the Sony X900E. This type of upscaling looks more jagged than other methods, but retains the sharpness of the original image. Native 4k content is displayed perfectly. The A9F has an excellent wide color gamut; slightly better than the A1E and nearly identical to the A8F. The EOTF follows the input stimulus perfectly, but clips at the TV's peak brightness. The 'Game' and 'Graphics' EOTFs are nearly identical to the 'Custom' EOTF, which is great. 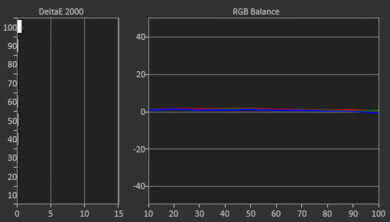 If you find HDR content too dim, you can adjust the Gamma, Contrast and Adv. 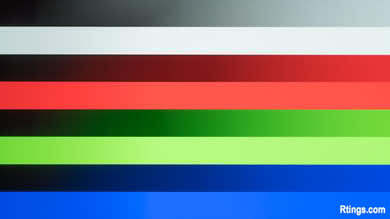 contrast enhancer, all of which make the TV brighter. With everything at maximum, HDR content will be noticeably brighter. Unlike previous Sony TVs, all picture modes on the A9F and Z9F follow the same EOTF. On older models, some picture modes would have a smoother roll off at the TV's peak brightness, so there would be less clipping. The A9F has very good color volume, by far the best color volume we've measured on an OLED TV. It can produce deep, dark colors across most of its color gamut, but can't produce colors as bright as pure white, especially blues. Outstanding gradient performance, better even than the Z9F. There is slight banding in all colors, but no significant banding in any color. If you see any banding, the Smooth Gradation feature can help, but may also result in some loss of fine details. There is very slight image retention on the A9F. These results are better than all other OLED TVs we've reviewed so far, with the exception of the LG B8. 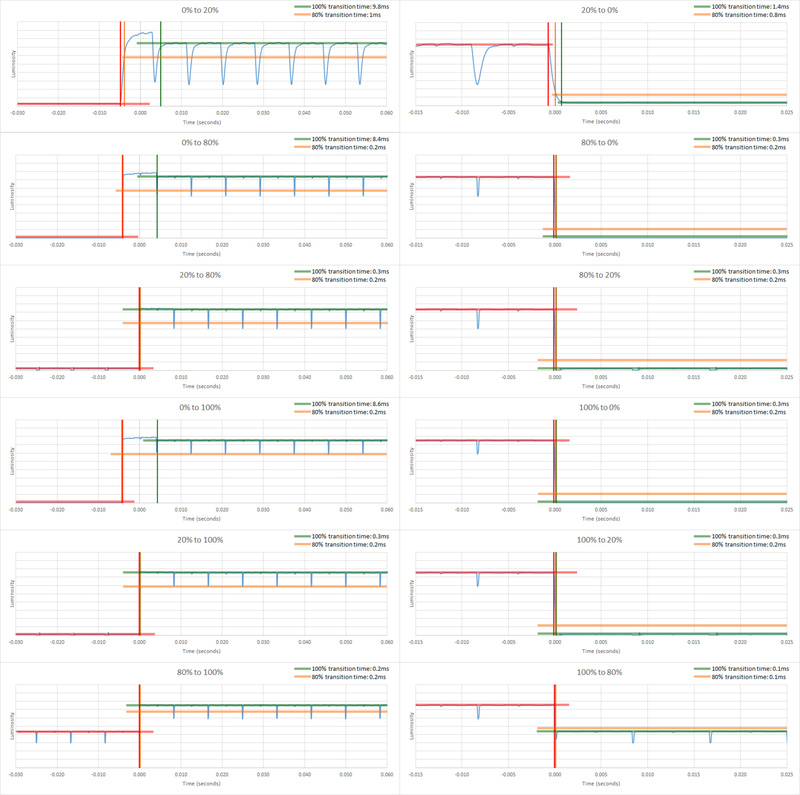 Note that there is some variation in temporary image retention performance, even between units of the same model so this difference may just be panel variance. 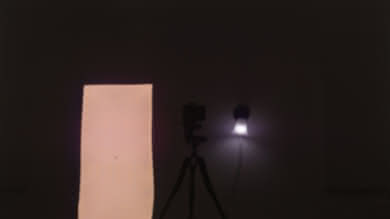 This test is only indicative of short term image retention and not the permanent burn-in that may occur with prolonged exposure to static images. We are currently running a test to help us better understand permanent burn-in. You can read about our investigation into this here. 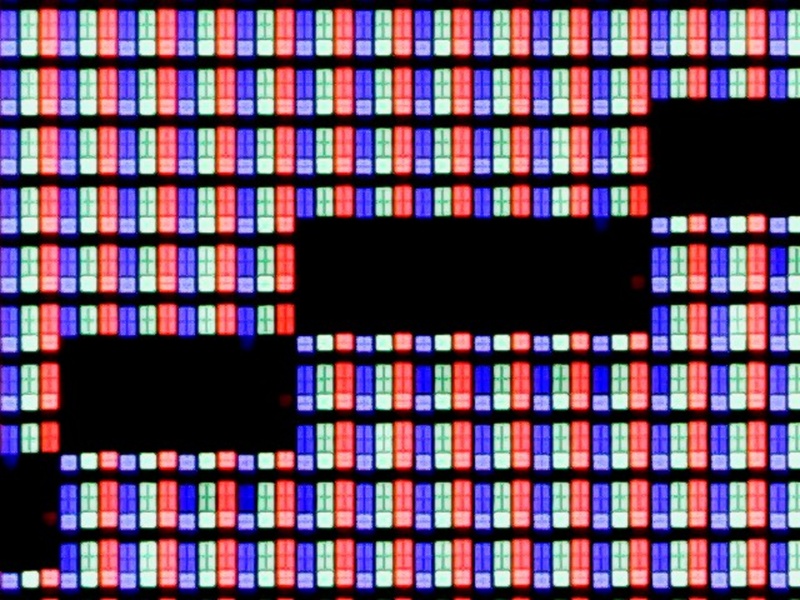 OLED TVs such as the Sony A9F are at risk to experience permanent burn-in. There is a pixel-shift option on the A9F that will shift the entire screen by a few pixels (this is not very noticeable) to help reduce the risk of burn-in. 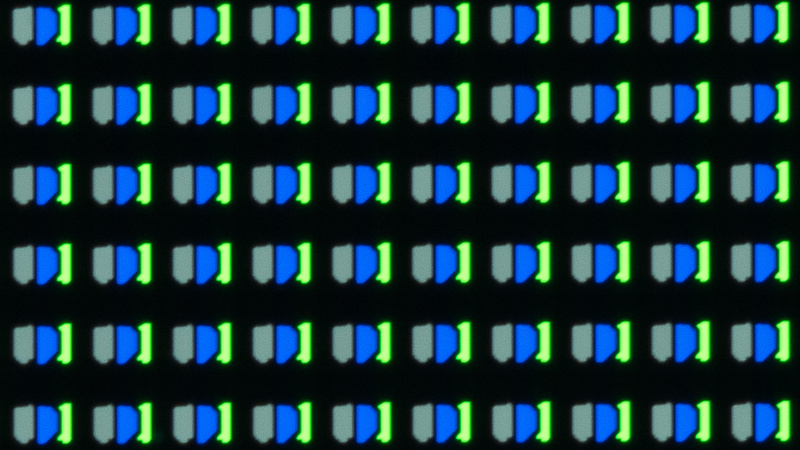 The A9F has a RGBW pixel structures, and all four sub-pixels are never on at the same time. 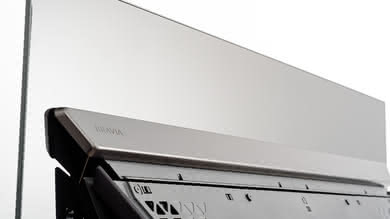 The Sony XBR-55A9F has excellent motion handling. The OLED panel has a near-instantaneous response time, creating an image that is completely free of motion blur. This effect may bother some people, especially in wide-panning shots in 24p movies. The A9F doesn't use PWM to dim, but it has the option to insert black frames to help motion appear more clear. Like all OLED TVs, the Sony 55A9F has a nearly instantaneous response time. This results in almost no trail behind fast moving objects, but the lack of blur may bother some people. 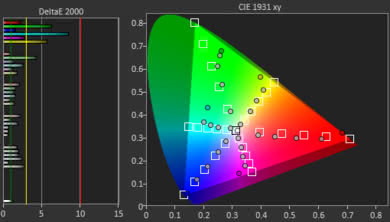 The A9F is nearly flicker-free, like all OLED TVs, since there is no backlight. Similar to the A8F, there are small dips in brightness approximately every 8 ms that correspond with the TV's native refresh rate. These aren't noticeable under normal viewing conditions. The A9F can insert black frames to simulate flicker, which can help motion appear clearer. It only supports 60 Hz flicker, which can bother some people. 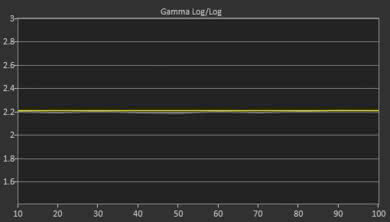 Unlike the LG C8, when 24p content is displayed on the A9F with BFI enabled, the BFI frequency changes to 48 Hz. 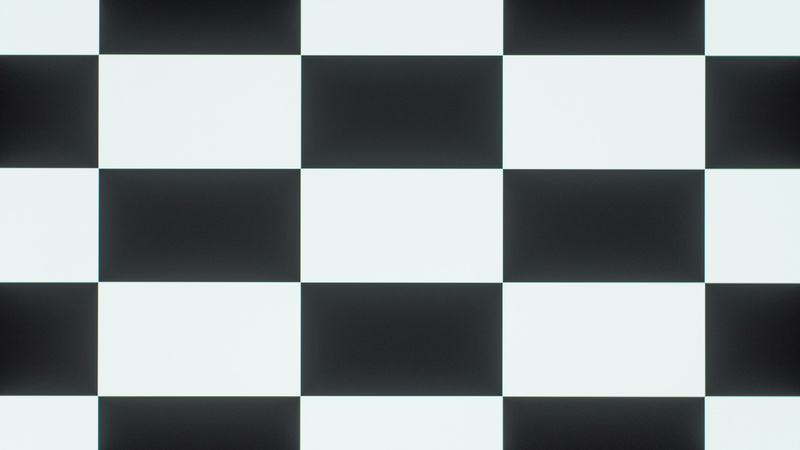 BFI is enabled on the A9F by setting Motionflow to 'Custom', Smoothness to 'Min', and Clearness to 'High'. The A9F can interpolate content to match the panel's native 120 Hz refresh rate. Like most TVs, this will introduce some motion artifacts, and in scenes of heavy action the TV will sometimes stop interpolating. 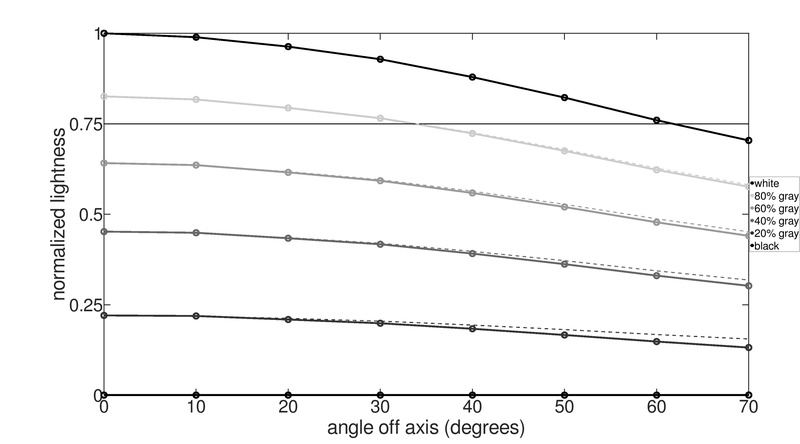 To enable motion interpolation on the A9F, set Motionflow to 'Custom', and increase the Smoothness slider. For 30 fps content, you must also set CineMotion to 'Auto'. Due to the near-instantaneous response time of the OLED panel, 24p motion in movies can look strange to some people and appear to stutter. 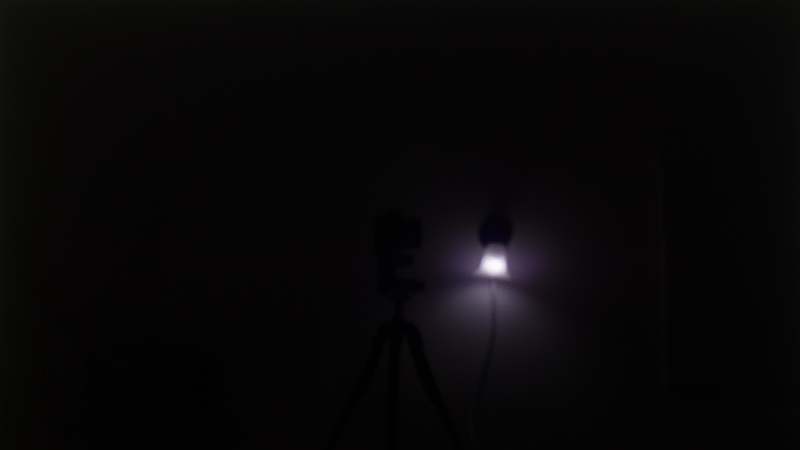 This is especially noticeable in slow, wide-panning shots. The A9F is judder-free when watching 24p movies from any source. From a native 24p source, no special settings are required, the A9F will automatically play them without judder. To remove judder from a 24p signal embedded in a 60p/60i source, or from the native apps, set Motionflow to 'custom', Smoothness to 'min', and CineMotion to 'auto'. When removing judder from a 60p source, enabling BFI causes extra judder. 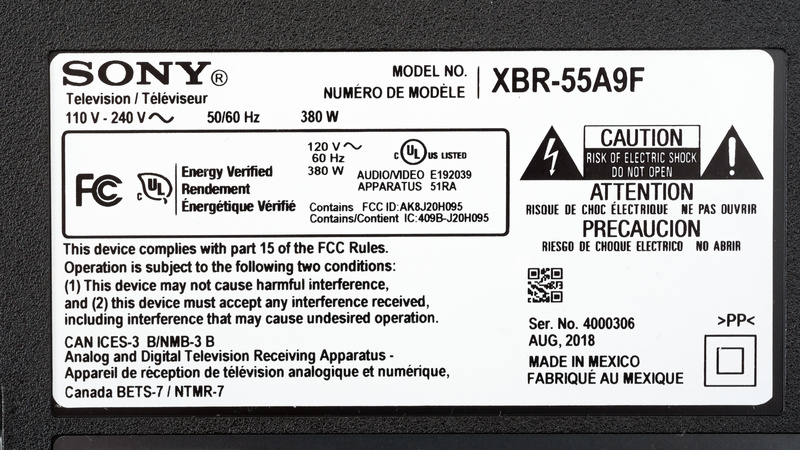 The A9F has a native 120 Hz panel, but like all Sony TVs, it does not support VRR. 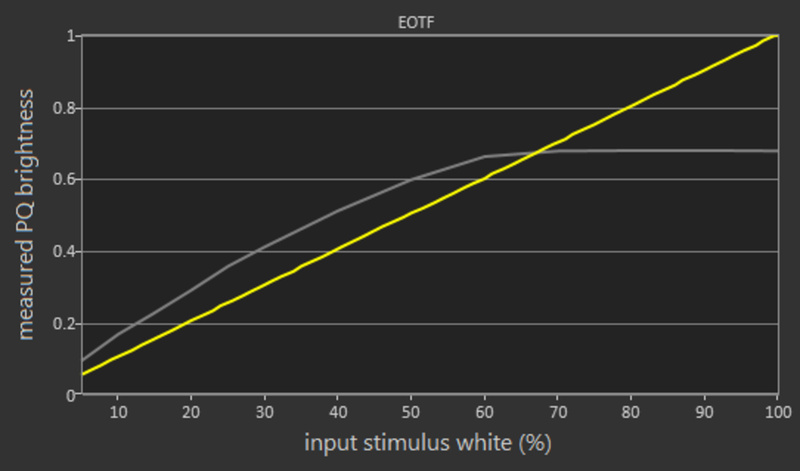 The A9F has excellent low input lag that should please most people. It supports all common resolutions, including native support for 1080p @ 120 Hz, great for Xbox One S/X owners. Chroma 4:4:4 is displayed perfectly, great for use as a PC monitor. 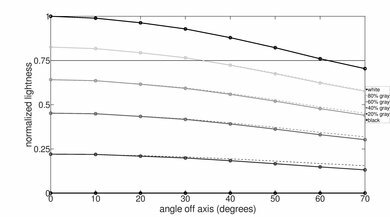 Note that when a 1080p @ 60 Hz signal is sent, the upscaling method changes to nearest neighbor. 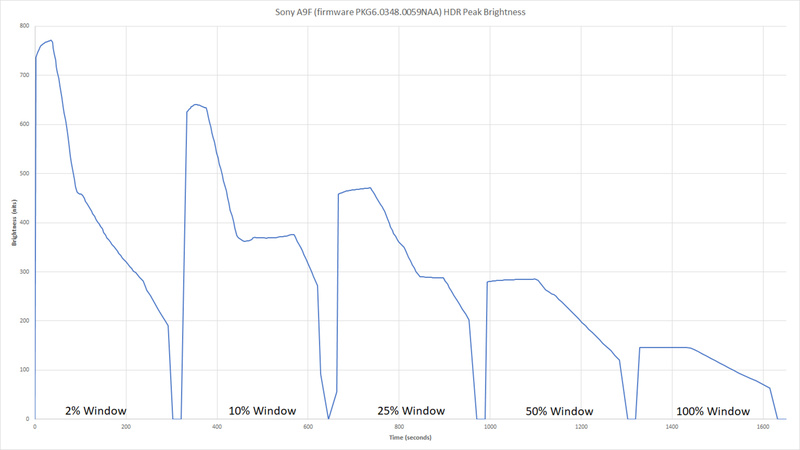 The A9F has excellent low input lag, a significant improvement over the A8F, but worse than the LG C8 and Sony Z9F. 1080p @ 120 Hz has even lower input lag, great for gaming, and unlike previous Sony TVs it is no longer necessary to force the resolution. The A9F supports all common resolutions without issue, including 1080p @ 120 Hz, which had to be forced on all previous Sony TVs. It displays 4:4:4 color perfectly, as long as either the 'Game' or 'Graphics' Picture Mode is used. When sent a 1080p signal with a 60 Hz or lower refresh rate, the upscaling algorithm switches to nearest neighbor, similar to the Sony X900E. There are side inputs on both sides of the stand. The other side has a single USB input. There is also a pair of audio in plugs, see the Rear Inputs box. The Sony A9F supports Dolby Vision, but external devices must be updated to support it. Like the Z9F, in our tests Dolby Vision worked on an Apple TV, but not from a Chromecast 4k. 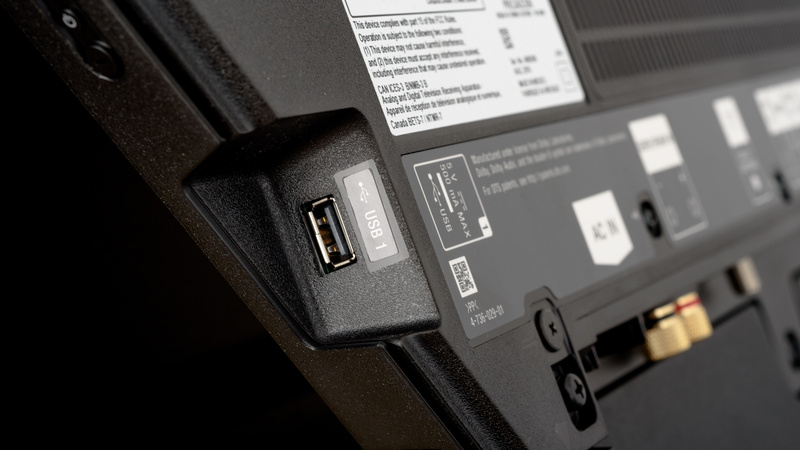 Like the Z9F, the A9F has four full bandwidth HDMI 2.0 ports, which is new for Sony TVs. The A9F supports eARC and HDCP 2.3, but unfortunately we have no way to test this at this moment, and very few devices are able to take advantage of these new technologies. Update 02/27/2019: eARC has now been tested, and is properly supported; see the Audio Passthrough box. DTS passthrough unfortunately didn't work with the A9F, which is odd for a Sony TV. It's possible this will be fixed with a later firmware update, but for now we recommend connecting external playback devices directly to your surround sound receiver if you want DTS playback. 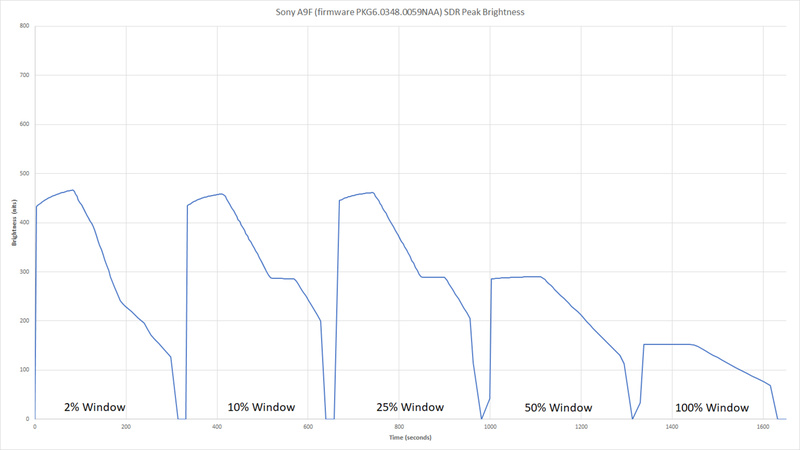 The Sony A9F has an above-average sound quality. This TV gets loud enough for most environments, produces clear and intelligible dialog, and has a decent punch to its bass. However, its bass lacks thump and rumble (no sub-bass) and tends to produce pumping and compression artifacts under heavier loads. Although this TV may sound good enough for some people, getting dedicated speakers is still recommended for a better sound. The older A1E measured slightly better in our test room, however, the difference won't be noticeable to most people in real life situations. The A9F features a new 'Audio System' mode, and can replace the center channel when connected to an audio receiver. 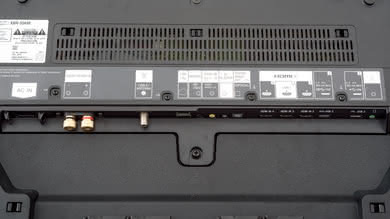 The TV needs to be turned on for the speakers to work, and enabling this mode disables the TV's internal sound. The frequency response of the A9F is good. LFE (low-frequency extension) is at 67Hz, which is good for a TV. This means this TV has a decent amount of punch to its bass. However, it still lacks sub-bass, so it won't produce any thump or rumble. The response above the LFE point is quite well-balanced, which is important for the reproduction of clear and intelligible dialog. Also, this TV gets quite loud, but produces noticeable pumping and compression artifacts under heavy loads. The older A1E has a very similar performance, but it measured slightly better than the A9F in our test room. The distortion performance of the A9F is mediocre. 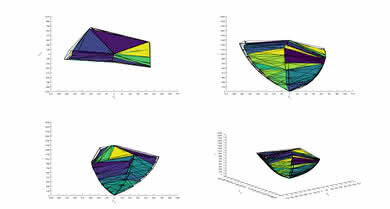 The amount of THD produced at 80dB SPL is quite low in the bass and mid ranges, but quite elevated in the treble range. This make the sound of the treble range a little impure, but this won't be very noticeable in real-life situations. At Max SPL, this TV, like most other Sony TVs, shows an significant rise in THD, but again, this will probably be only noticeable with test signals. The older A1E doesn't have the elevated treble THD at 80dB SPL, but its Max SPL THD is quite similar. The A9F has great smart features. 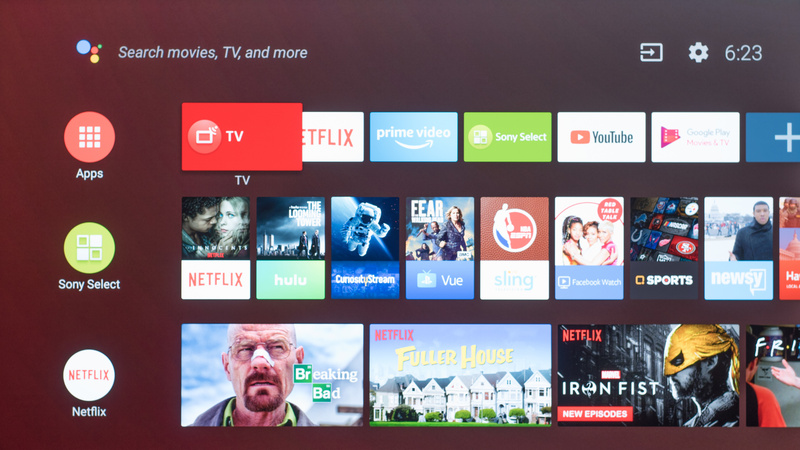 The updated Android TV OS and faster chipset make for a much faster experience than the previous Sony TVs. The main interface is well organized, and highly customizable. The Google Play Store has an excellent selection of apps. The Android 8.0 interface is well organized and easy to navigate. The general layout is a significant improvement over previous Sony models. Some common apps, like the settings menu, are now easier to access as they have been moved to the top of the page. While the main interface has been updated, the settings menu hasn't. Some settings are difficult to find and it takes some getting used to. Like all Sony TVs so far, there are no ads on the A9F. 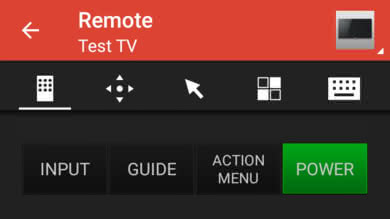 There is suggested content in the home menu, but it can be disabled by removing the channel. 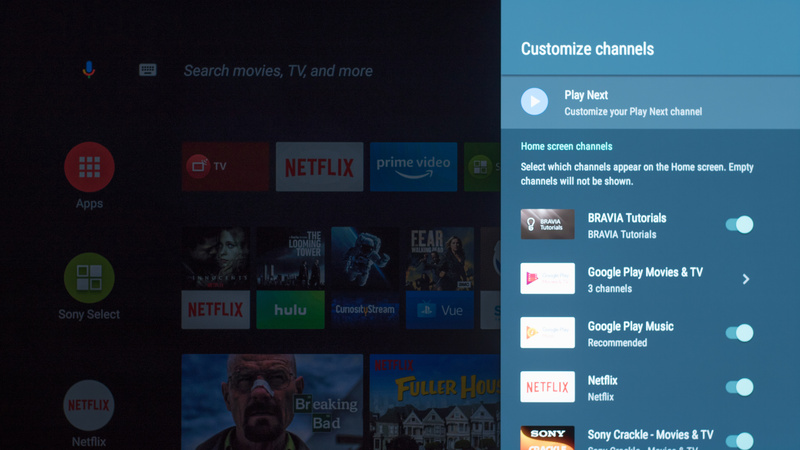 Like the Z9F and previous Sony TVs, the Google Play Store has an excellent selection of apps. There is a good selection of pre-installed apps. The included native apps are fast and easy to use. The A9F has the same remote control as the Z9F. 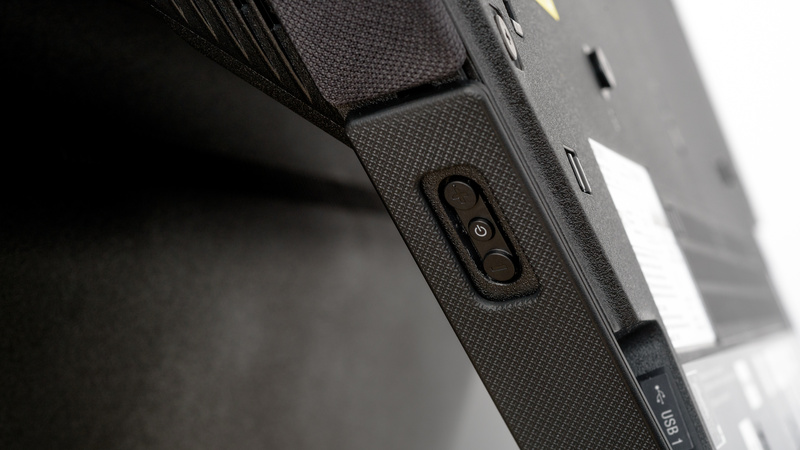 It has a rubberized back, and soft touch buttons. 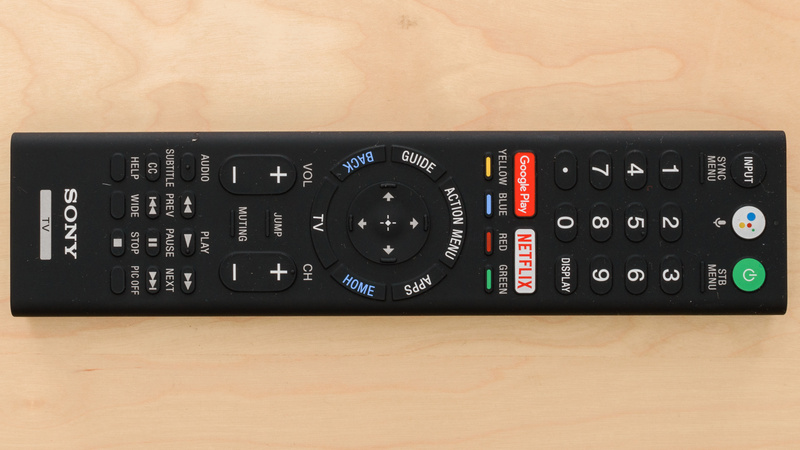 There are a lot of buttons, more than most remotes from other brands. 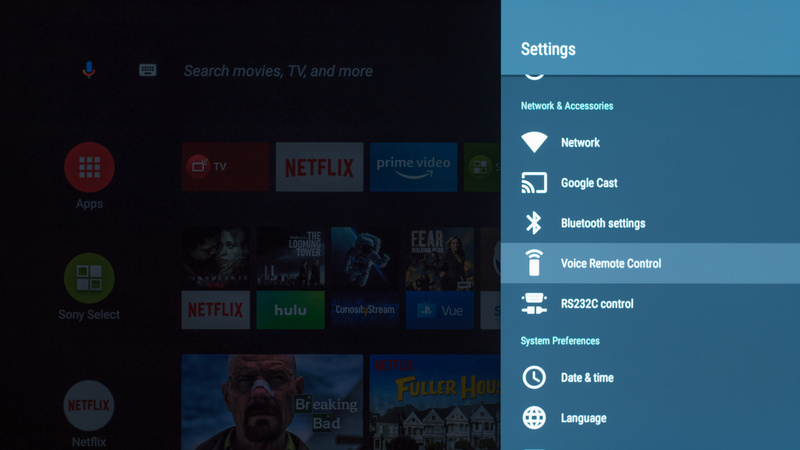 There is also a quick access button for Netflix, the Google Play Store, and Google Assistant voice control. Most of the remote functions require direct line-of-sight to the TV. 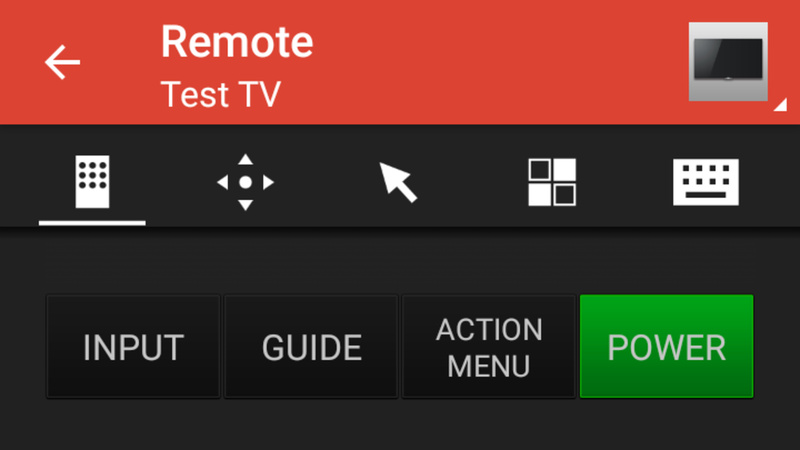 The remote app isn't great, but it covers the basic functions, and works well as a replacement remote. It would be nice to be able to input text in third party apps, but very few TVs can do this. It can be used to stream files from your phone/tablet to the TV. 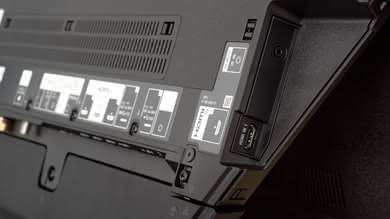 The A9F has a similar control scheme to the other 2018 Sony TVs like the Z9F and X900F. It allows quick access to change channels, inputs, and adjust the volume, as well as powering the TV on or off. We tested the 55" Sony MASTER Series A9F (XBR55A9F), and for the most part, we expect our review to be valid for the 65" model (XBR65A9F) as well. 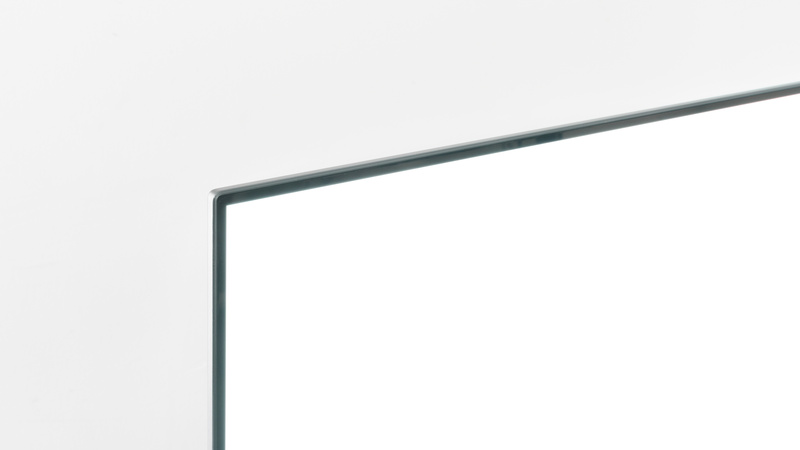 The European variant of the TV is also known as the AF9, and we expect it to offer the same performance. If someone comes across a different type of panel or if their Sony A9F doesn't correspond to our review, let us know and we will update the review. Note that some tests such as the gray uniformity may vary between individual units. Top left: Sony Z9F(XBR65Z9F). Bottom left: Vizio P Series Quantum (PQ65-F1). Middle: Sony A9F (XBR55A9F). Top right: Sony Z9D (XBR65Z9D). Bottom right: Sony A8F (XBR55A8F). Unlike our other photographs, this picture wasn't taken under a controlled environment, so do not draw conclusions from it. The Sony A9F is an excellent OLED TV, but it faces steep competition from LG and Samsung in the top-end TV market. 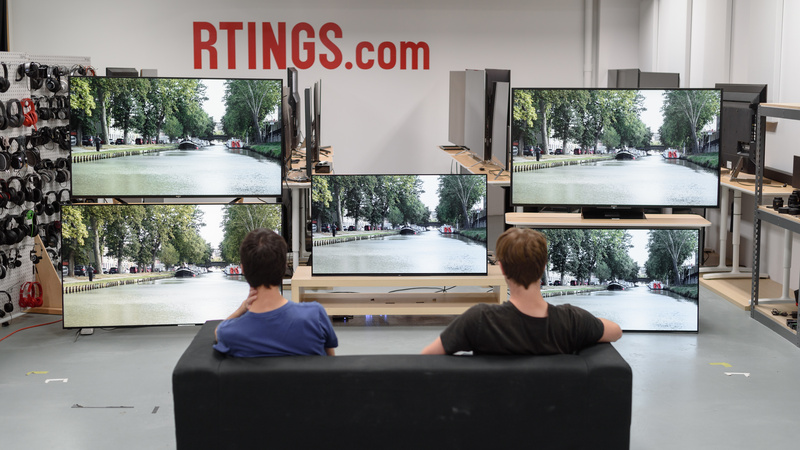 See our recommendations for the best televisions and the best flatscreen TVs. The Sony XBR-55A9F is an excellent TV that can handle just about anything. It is an outstanding TV for watching movies or gaming in a dark room. It has excellent motion handling and low input lag, great for fast paced content or gaming. Like all OLED TVs, there is a risk of temporary image retention and even permanent burn-in, although we don't expect this to be an issue for most people. The A9F is outstanding for watching movies in a dark room. 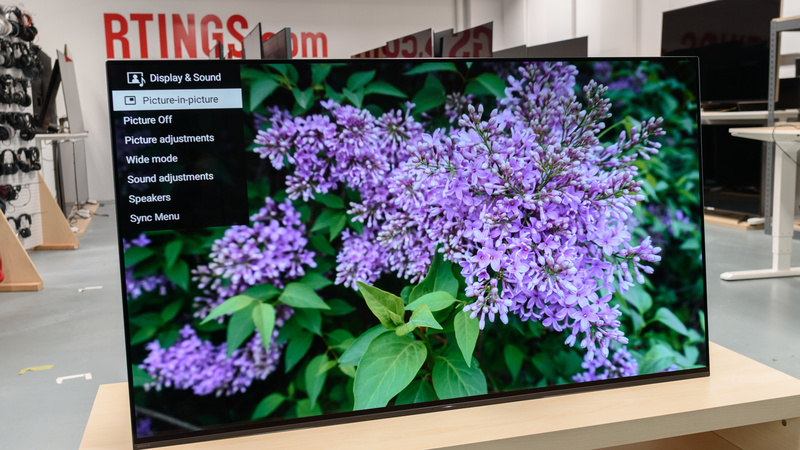 The OLED panel delivers a perfect dark room viewing experience, and the image looks great, even if you are viewing from the side. It has a near instantaneous response time, which may bother some people as 24p content stutters. It is also free from 24p judder. The A9F is a great choice for watching TV shows during the day. The wide viewing angles make it a perfect choice for someone that likes to move about with the TV on. It has excellent reflection handling, but might not be quite bright enough to overcome glare if you have a lot of windows. If you're a fan of the soap opera effect, the 120 Hz motion interpolation is a great option. The Sony A9F is great for sports fans. 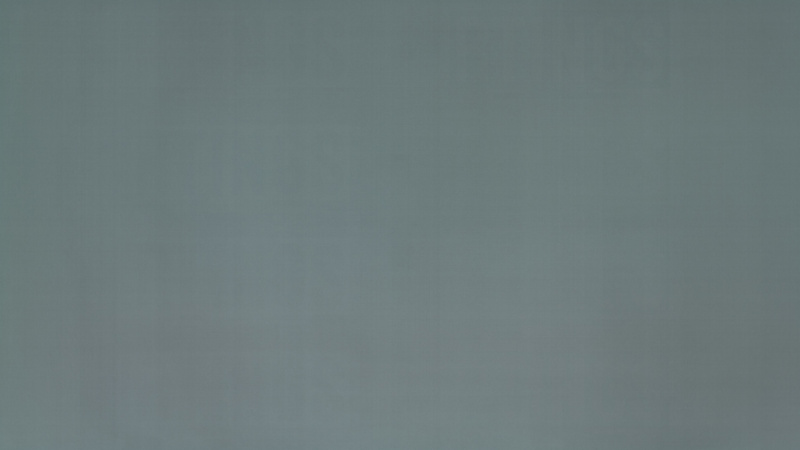 It has excellent gray uniformity with very little dirty screen effect. Fast moving objects appear clear, with very little motion blur thanks to the near-instantaneous response time. It has wide viewing angles and good peak brightness, good for watching the big game with a large group of friends. Excellent TV for playing video games. It has excellent low input lag and supports all common resolutions. Fast moving objects are crisp and clear, and it has an optional black frame insertion feature to further improve motion. It has excellent dark room performance, great for late night gaming. Unfortunately, the A9F does not support any variable refresh rate technologies, like FreeSync, and there is a risk of permanent burn-in. The Sony A9F delivers a truly remarkable HDR movie experience. The infinite blacks deliver a perfect dark room experience, and the wide color gamut and very good color volume deliver outstanding picture quality. Unfortunately, it has only decent brightness in HDR, so some really bright scenes clip, and pure white scenes aren't very bright. The A9F is an excellent TV for playing games in HDR. The OLED panel is perfect for playing in a dark room, as it delivers true blacks and perfect black uniformity. It has excellent low input lag and a near-instantaneous response time. It has decent brightness in HDR, but large white scenes aren't very bright. There is also a risk of temporary image retention and permanent burn-in. The XBR55A9F is a very good TV for use as a PC monitor. The wide viewing angles ensure an accurate image, even when sitting up close. It supports all common resolutions, and chroma 4:4:4 is displayed perfectly. Unfortunately, there is a risk of permanent burn-in when displaying static content, like menu bars, for long periods of time.